Wednesday, November 16, Metrolinx is holding a public meeting at Riverdale Collegiate to talk about their plans for their electrification and expansion of the GO track system in our neighbourhood associated with Smart Track and GO RER. There is an Open House from 6:30 to 7 p.m. and formal presentations at 7 pm. This entry was posted in Event on November 15, 2016 by The Ashbridge's neighbourhood. 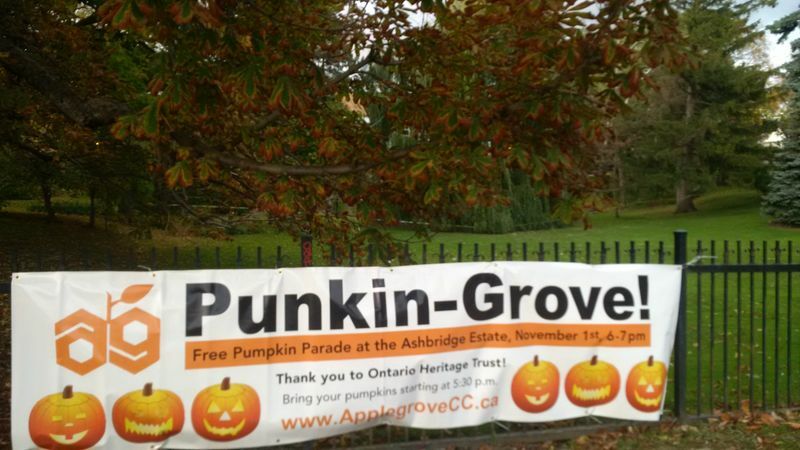 Tuesday November 1 at the Ashbridge Estate – bring your jack-o-lantern to Punkin-Grove. Starting 5:30 to receive pumpkins, the event is from 6 to 7 p.m.
Then on Saturday November 5, the social event of the year – Pasta Fest at Baron Byng Beaches Legion Hall, Coxwell just south of Gerrard East. See more on the Applegrove events page. This entry was posted in Applegrove Community Complex, Ashbridge Estate, Ashdale Village / Little India, Gerrard Street East, Coxwell Avenue, Event on November 1, 2016 by The Ashbridge's neighbourhood.